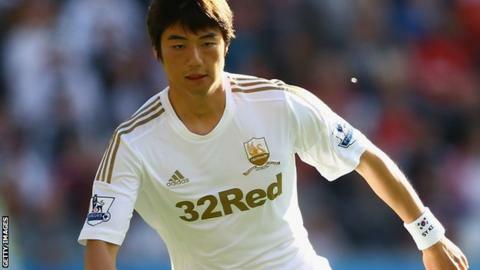 Midfielder Ki Sung-Yeung has been ruled out of Swansea City's trip to Newcastle United on Saturday with a hamstring injury. The South Korean picked up the injury late on in the 1-1 draw at Southampton. A scan on Monday revealed a tear which could rule him out for up to 10 days. Ki has made 11 appearances since signing from Celtic in the summer after starring for South Korea in the London Olympics. The 23-year-old former Korean player of the year has impressed in Swansea's midfield following the departure of Welsh international Joe Allen for Liverpool. There is some better injury news for the Swans, with striker Danny Graham expected to return following a back injury. Graham scored 12 Premier League goals last season, but has scored just once in the League this season. And defender Chico Flores is also hoping to be fit following a thigh problem which kept him out of the matches against Chelsea and Southampton. Meanwhile, Swansea have recalled striker Leroy Lita from his loan spell at Birmingham City. Lita has been struggling with a nagging thigh injury and, with his three-month loan spell due to end in mid-December, both clubs agreed to the striker returning to Swansea for his rehabilitation. Neither club has ruled out the possibility of Lita returning to St Andrews for another loan spell in the future. The 27-year-old has made 10 Championship appearances for The Blues, scoring three goals.